The market context for telecom operators becomes increasingly challenging. We operate in a mature market with intense local competition and an increasing disruption of voice, SMS and linear TV by new over-the-top players in both the residential (WhatsApp, Netflix,…) and enterprise (Microsoft Teams, cloud, API, SDWAN,…) market. At the same time regulation focusses on lowering consumer prices with the end of roaming, the opening of fiber, Easy Switch and a potential 4th mobile operator. year, closing 2018 with a 2.4% increase. We also maintained our high investments pace with € 1,019 million invested with a clear focus on digitalization, networks and overall customer experience. The deployment of our future-proof network in the context of the Fiber for Belgium project kicked off early 2017, with the roll-out ongoing in 9 cities in 2018. We also invested extensively in IT systems and digital platforms and in further enhancing our mobile network. 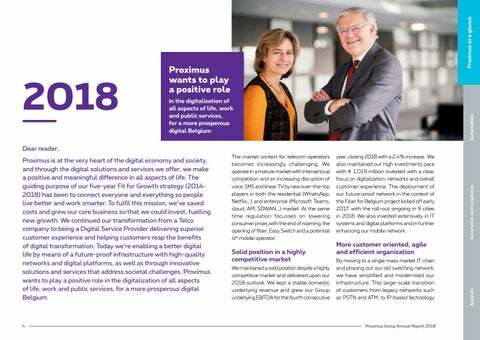 Proximus is at the very heart of the digital economy and society, and through the digital solutions and services we offer, we make a positive and meaningful difference in all aspects of life. The guiding purpose of our five-year Fit for Growth strategy (20142018) has been to connect everyone and everything so people live better and work smarter. To fulfil this mission, we’ve saved costs and grew our core business so that we could invest, fuelling new growth. We continued our transformation from a Telco company to being a Digital Service Provider delivering superior customer experience and helping customers reap the benefits of digital transformation. Today we’re enabling a better digital life by means of a future-proof infrastructure with high-quality networks and digital platforms, as well as through innovative solutions and services that address societal challenges. 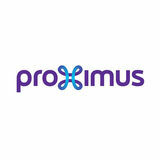 Proximus wants to play a positive role in the digitalization of all aspects of life, work and public services, for a more prosperous digital Belgium.